Zelda’s shoes being “hot set”. Don’t worry, it doesn’t hurt the horse (at least if it’s done right). It helps improve the fit of the shoe. Today was the day that my horses got shod for the spring hunt season. That means shoes all around for Freedom and front shoes for Zelda. I’d pulled their shoes after the first snow and going barefoot for the winter was good for them. Both horses are coming into the spring with great looking feet. In particular, Zelda was able to grow out the divot in her front right hoof — something that had plagued her since she’d arrived in June of last year. 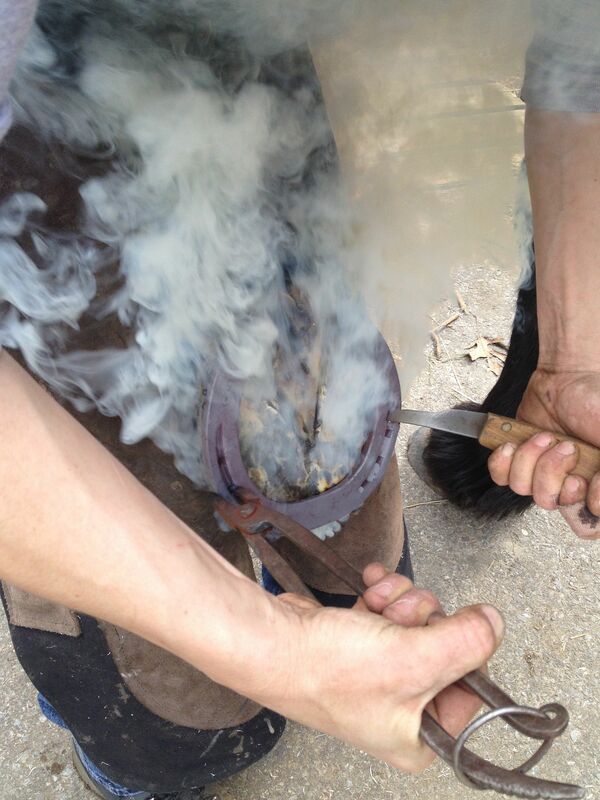 For Zelda, my farrier heats the shoes in her forge and then shapes them to her foot. Working with hot metal allows the farrier to make subtle adjustments to the shoe, which (if done correctly) achieve a better fit. It is considered to be “hot shoeing” even if you don’t set the shoe hot. Setting the shoe while it’s hot (not red hot) cauterizes and seals the hoof but it also can help set the shoe more precisely, enabling a tighter, more stable fit. This is especially true when you’re using clips. 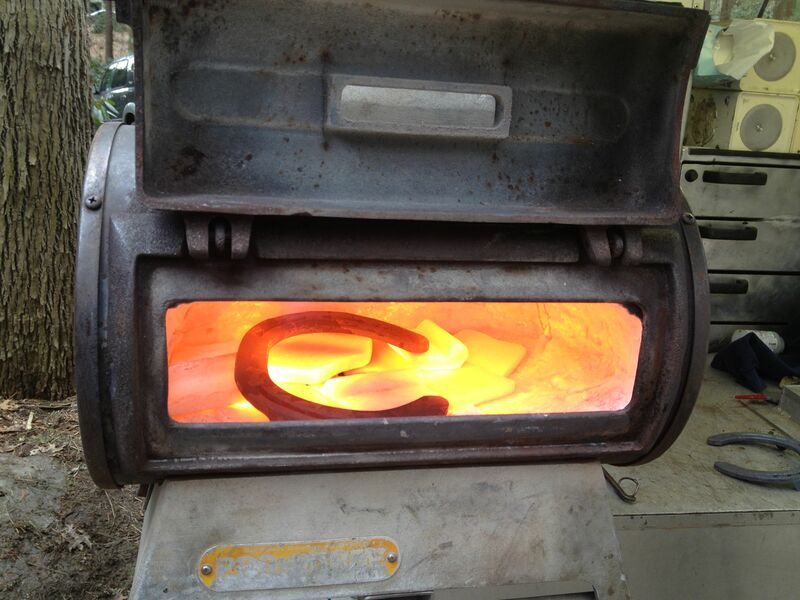 The shoe is heated up in the forge so it can be shaped. Is hot shoeing “better” than cold shoeing? I hope my friend Fran Jurga will pipe up here, as she knows a lot more than I do about this subject! My feeling is that if the farrier is skilled, they can achieve a good fit with either method, but that some farriers go with a cold shoeing method because it’s more economical (and faster) to tap on a shoe that’s a good fit and then rasp the hoof to shape it. We had never hot set the shoes to Zelda before and that first time is always a bit of a gamble. Some horses don’t like it. But Zelda? She couldn’t have cared less. Hot shoeing is not as common as it once was. Now farriers can purchase a wide variety of shapes and sizes, so custom fabricating or modifications are often not as necessary. When shoeing large, heavy horses, it is more frequently employed because the shoes they wear are larger and heavier. How do your farriers shoe?